Every now and then, every football fan will see one game that he will never forget; one that he will remember exactly where he watched fifty years later, who he watched it with and most of the details. In 1989, the Nigerian Flying Eagles came from 4-0 down against the USSR in the quarter-finals of the Under 21 championships. With 25 minutes to go, the deficit was overturned and we went on to win the game on penalties. No Nigerian of my generation will forget the game that came to be known as the "Miracle in Damman"
The next time I saw such a thriller, I was on the receiving end as I saw Arsenal throw away a 4-0 lead against Newcastle United to draw the game at 4-4. Needless to say, that's one I would rather not remember but it's etched in my medulla and won't be going away any time soon. Yeah! Taking the bitter with the sweet. Arsenal fans; close your eyes or log off. It's 4-nil to Reading now. The best I could hope for was damage control - don't concede any more and score a couple to make the scoreline a bit more respectable. In my Blackberry group of Gunners, only the man called Giddyz was optimistic enough to predict that the game will go to 4-4. One person out of 30. That's how much the odds were stacked against the lads. But Wham! Bang! Would you believe it, the game ended 4-4 in regulation time. Into extra time and the game continued to thrill as Chamakh put us 5-4 ahead in the 97th minute. Yeah, you heard right, The Chamakh. He woke up and as if someone reminded him of his responsibilities as a striker, he drilled that one home from outside the 18 yard box finishing a move he had been a key part of its build up after laying a beautifully disguised pass to Giroud before running unto the final ball from Arshavin. I thought there was still another goal in the game at this time but I thought it was going to be us stretching it to 6-4 after all the momentum was with us at this time. Would you believe it, Reading got another one and took it to 5-5. Then Walcott struck again to take it to 6-5. This had to be it. But no, Chamakh wasn't through with Reading yet. Truth be told, there is need for an inquest into last night's game despite the final result. 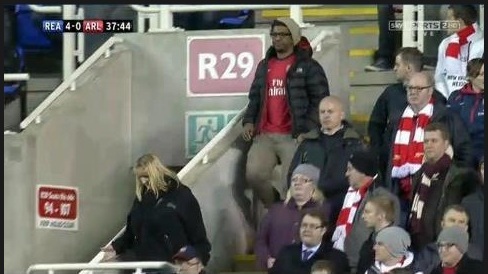 I am Arsene Wenger's biggest fan but yesterday I found myself questioning his selection for that game. 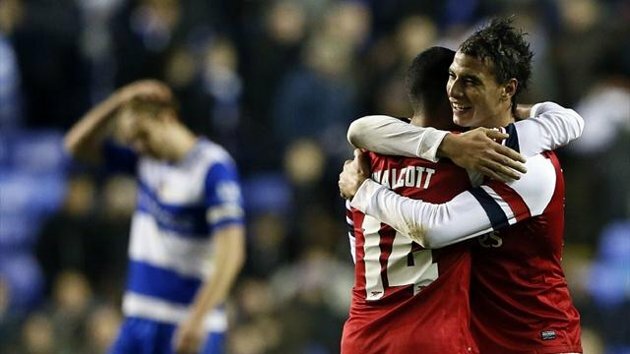 It's true that any Arsenal eleven selected to play Reading is expected to represent the club creditably well. But we all know that's not the reality judging from the lack of depth that the team has shown of recent in the Premier league with some of the first choice players out injured. Their replacements haven't stepped up to the plate. Rolling out a less than cohesive team against a Premier league side even if that club is a relegation candidate smirked of arrogance. And we so very nearly paid dearly for it. We've learnt not to put too much heart into this competition since we use it to bloody youth but nothing prepared us for the route that game was headed for just before half time. It was an embarrassing site to see. It turned out well in the end but it could so easily have gone the other way. A lot of fans have developed weak hearts over the past few years following this club and yesterday at 4 nil down may have been the last straw. Sure hope not. The second issue that inquest will have to deal with is Koscielny: asset or liability? He was culpable for the first two goals we conceded last night. Both due to poor positional awareness. For the first he failed to track Jason Roberts as a cross came into the box. For the second he turned the ball past his keeper into his own net from another cross into the box. He's done this too often. And he always manages to score one in the right net whenever he scores these own goals. He's got worth it takes but like the errant, undisciplined pupil he needs to do detention after everyone else has gone home. The third issue is Djourou: have not seen him play in a while and seeing him yesterday showed why he is where he is despite the time he has spent at the club. He isn't even decent third choice. Why keep him if we can't count on him when it counts? There are quite a few questions raised by last night's game but I'll leave you to slot yours in. Arshavin! One of my favourite players when he first arrived. Now a fringe player. Last night he swayed from brilliant most of the time to terrible some of the time. He was arguably the most influential player for Arsenal last night but I couldn't help the feeling that he will never be the li'l Russian we saw put four past Liverpool at Anfield a few years back. It was the first time I acknowledged this fact. Giroud's influence on the game can not be over-emphasized. He got the second goal a few minutes after he came on as a second half substitute and looked like he was on a mission to save our hides. He was unlucky not score more. A lot more would have been said about a Giroud goal but the overall thrill of the game eclipsed that bit of news. Tomas Eisfelds introduction in the first half certainly cranked things up a notch. He was a breath of fresh air in a midfield where Coquelin and Frimong had looked out of sorts and took a firm grip of the midfield once he came on. Couldn't help wondering why Wenger hadn't started him but I guess there was a lesson to be learnt here. Then to the issue of Walcott who got a hat trick on the night (Sorry Jenks, Theo's ball crossed the line). I have no doubt that the club wants to keep the lad at the club. That really is the sensible thing to do considering that no one else at the club has the influence he does on that right side of the midfield (problem is that isn't where he wants to be). His influence on the field can not be denied. I think the club should do what it can to keep him at the club. It just shouldn't be on the terms being rumoured that he's asking for which includes a 100k/week pay check. It was a thrilling game, guys and we had the last laugh but the scoreline does not flatter our abilities going into United away at the weekend. So when the thrill wears off, let the inquest begin. On a parting note, "Walcott, sign da ting"